It seems as if the whole world is in love with pizza and it's easy to understand why. It's tasty, filling, and home to so many toppings—there's always something for everyone. 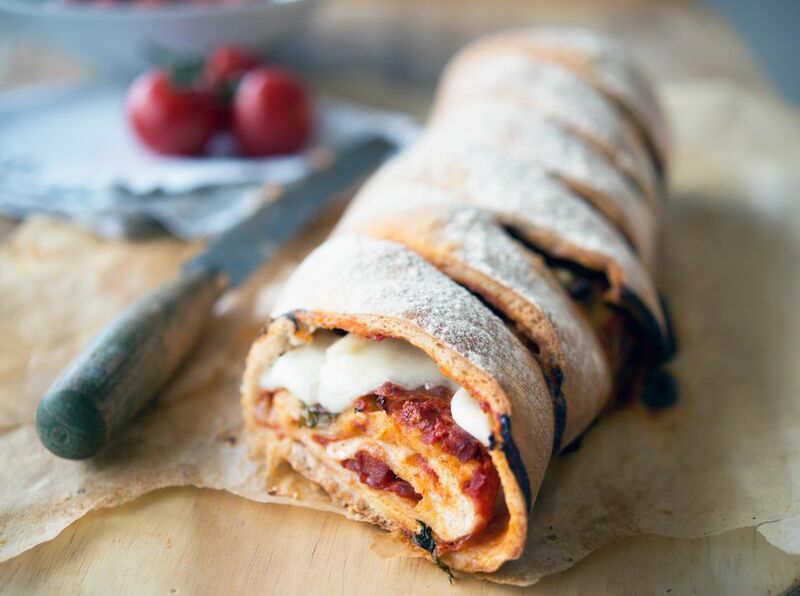 You'd think it would be hard to better the Italian classic; well, say hello to the stromboli, a dish which starts out looking like a pizza, but ends up more like a savory roulade. Don't get this confused with pizza's other sibling, the calzone. A stromboli is baked with the sauce as part of the filling, while a turnover-shaped calzone has it served in the side for dipping. Traditionally, stromboli will contain cold cut meats and mozzarella, but much like its cousin, the pizza, almost anything you wish can go into the filling. Add vegetables, more meats, different cheeses, or other herbs and spices. The ring-shaped dish is also incredibly versatile (and quick to whip up when using store-bought pizza dough). Serve it hot from the oven, sliced up for a buffet table, eaten cold at a picnic—what more can you ask from one dish? Start with the dough: in a large bowl, mix the flour with the yeast, add the sugar and salt and mix again. Add the oil and half a cup of lukewarm water. Mix to create a soft, slightly sticky dough. If the mixture feels dry, add a little more water, more flour if too wet. Turn the dough onto a floured surface and knead for at least 7 minutes to create a smooth and elastic dough. Coat a large baking bowl with oil, tip in the kneaded mixture, cover with plastic wrap and leave to rise in a warm, draft-free place until double the size; this will take at least an hour. Lightly oil a large baking sheet, cover with a sheet of parchment paper, and set aside. Turn the dough out once more onto a lightly floured surface. Roll out into a rectangular shape measuring approximately 16 x 12 inches. Slide the rectangle onto the baking sheet and reshape if it twists a little. Spread the tomato sauce over the dough, leaving a half inch margin all the way around. Scatter the chorizo and ham evenly over the dough. Tear the mozzarella balls into rough chunks and scatter evenly over the meat, along with the black olives. Finally, tear the basil leaves and scatter likewise. Make the roll: lightly brush all four edges of the dough with plain water. Fold the short sides in, then starting with the longest side close to you, quickly and not too tightly, roll up the stromboli. Once rolled, tightly pinch the seam to seal in the filling and to prevent the stromboli from springing open. Cover the roll with lightly oiled plastic wrap and leave to rise in the same place as before for 30 minutes. Lightly dust the pizza roll with flour. Then, with a very sharp knife or a craft cutter, make 6 to 8 slashes across the top. Bake in the center of the hot oven for 30 minutes, checking from time to time that the surface is not burning or cooking too quickly. If it is, lower the heat slightly. The stromboli is ready when, by gently rolling on its side and checking, the bottom is cooked and golden brown. Remove from the oven and leave to cool for a few minutes and serve with a crisp green salad. The stromboli is also delicious cold the next day, so it makes fabulous make-ahead party food.